Beautiful apartment downtown - panoramic mountain views. This apartment located in the heart of a residential 8 apts 500m from the Font Romeu Tourist Office. 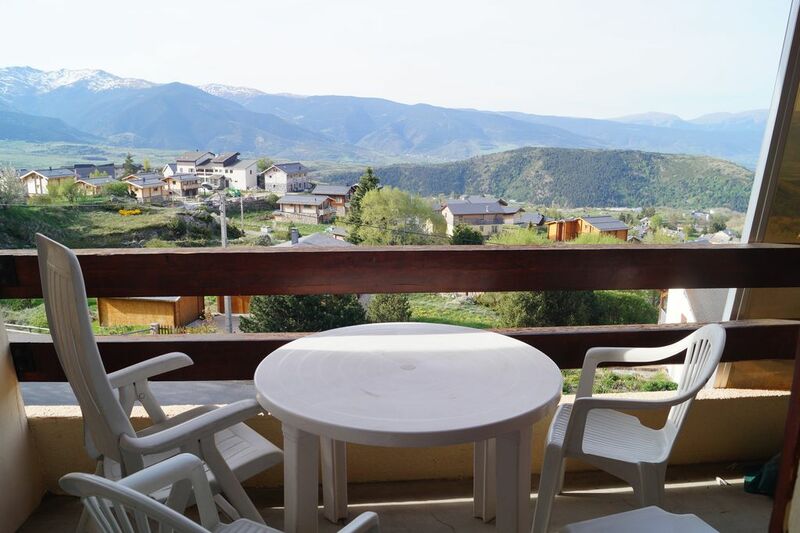 The apartment enjoys a panoramic view of the Pyrenees. No vis à vis. A reserved parking space and free. Upstairs a large loft with a double bed and a single bed. A bathroom with toilet and washing machine. Located 6 minutes walk from the hyper center with all amenities: Super market, bakery, charcuterie, pharmacy, restaurants, .... Cabins cabins is located right next to the tourist office and takes you directly to the feet of the tracks of the station. IF you favorite car you are within 5 minutes from the inner city and about 10 minutes from the ski / hiking resort. L'appartement est sympa et bien équipé , une vue magnifique, je recommande. L'appartement est très sympa, bien exposé. Les enfants ont apprécié la mezzanine,espace grand et agréable pour se reposer et jouer (jeux mis à disposition par les propriétaires,super idée). L'appartement est bien situé, 10 min à pied du centre ville, 10 min de la station en voiture. Semaine très chouette avec le beau temps en plus. La pied dan la centre ville est dificiel pour enfents et vieux gens. Ne propre pas, becoupe de servies dans le cuisine. Les lits ne confortable pas. Vue tres bien. Toilet et sal de bain oke la bas. Font Romeu tres bien aussi pour les enfants, me aussi pour adults. Très bel appartement familial, tout est fait pour la famille, il ne manque rien. Merci encore ! Superbe vue , a 4km des pistes. Merci pour votre message. C est effectivement l'esprit dans lequel nous avons aménagé notre appartement. Au plaisir de vous revoir ! Apartamento bonito y con buenas vistas. Ideal para estar un par de dias y desconectar. Suffisamment de place pour tout le monde; vue imprenable;un peu de sport pour aller chercher le pain! Apartment located in the center of Font Romeu Via Odélio. A 6-minute walk from downtown and cabs to reach the ski area. Alpine ski resort. Major golf skiing and snowshoeing. Ski resort that offers a ski area in the most modern and most attractive of the massif. The tracks will naturally blend in an unspoilt nature, great white is savored, the rhythm of a good life found cohabiting harmoniously with large panoramic spaces. It is in a very southern atmosphere that combines harmoniously station equipment and landscaped areas for everyone, learning areas for small children adrenaline on the northern slopes and descent through the spectacular Snowpark for surfers and riders of all backgrounds, each finds its pleasure. Font Romeu is also a spa suite showers, spas and other equipment for relaxation. Hiking trails in summer you will discover the breathtaking panorama of the valley. Located at 1h30 from Perpignan, 2h00 from Toulouse, 2h00 from Barcelona. Ideal for family holidays to discover the prehistoric site of Tautavel in Perpignan, Prehistory Niaux the park at 1:00 and the many caves.